We like to have fun with all kinds of stats over here. Usually, we look for something more valuable than a minuscule sample size of Spring Training stats that are almost meaningless because of varying competition levels and the uncertainty of some players goals in each plate appearance. Because the outcome of Spring games mean nothing, some pitchers could be looking to work on a specific pitch - particularly pitches that need work. Batters similarly can be working on a approach at the plate that might not lead to reaching base, but can prepare them for situations when they need to move a runner over, or maybe they take 2 strikes to work on hitting with 2 strikes. Greg Maddux used to famously set up hitters in Spring Training by throwing them pitches in a sequence they would never see in real games. We just don't know. One of the most predictive pitching stats, of regular games is the strikeout-to-walk ratio. We get some surprising names in the list of Top 11 pitchers by spring K:BB ratio. How about classic Dice-K showing up? That's fun! He's given up 18 hits and 8 runs in 12 2/3rd innings in spite of a striking out twelve and only walking one. The Cubs should be pleased that they have two of the top eleven K/BB pitchers. Edwin Jackson and Travis Wood are probably evolving into trade chips for the Cubs, limiting walks while missing bats this season will raise their stock. Evan Reed, who is out of options, could be solidifying his spot in the Tigers' bullpen by striking out 11 batters for each walk. For hitting, we will look at two stats. OPS, with min 30 plate appearances (LOL), and Home Runs. I'm not surprised to see Mike Moustakas at the top of this list. He's had glowing reports from scouts and reporters all Spring. The Yankees are reportedly shopping Francisco Cervelli. These stats are aligned with the fact that he's been a pretty good hitter in the big leagues during limited playing time the past few years. Since 2010, Cervelli has a .352 OBP, which is not bad for any hitter, let alone a backstop. Brandon Moss had a great season last year and looks to continue his success as the left-handed part of another A's platoon. The Mariners are more inclined to trade Nick Franklin than Brad Miller. I wonder if potential trade partners might try to make their best offer available, but only for Brad Miller. Austin Jackson could do some serious damage if he sticks to the #5 spot of the Tigers order, after scoring 395 runs over his 4-year career, primarily as a leadoff or lower in the order batter. As a middle-of-the-order slugger, we can expect more of Jackson's counting numbers to become RBI's. Chris Heisey is on this list primarily as a result of leading all batters with five homeruns this Spring. More on that in a minute. I don't know Yangervis Solarte or Steven Souza. Do you? Solarte is new to the Yankees' system. His first six professional seasons were in the Twins organization, and he spent the last two years on the Rangers' triple-A team, the Round Rock Express. He's a non-roster invitee to the Yankees spring training, so we'll see if he can at least solidify a spot on their Triple-A squad. Steven Souza has never gotten past double-A, but he hit pretty well there last year. In 77 games playes (323 plate appearances), he slashed an impressive .300/.396/.557. Woo hoo! Javy Baez and Mike Olt! Go Cubs! 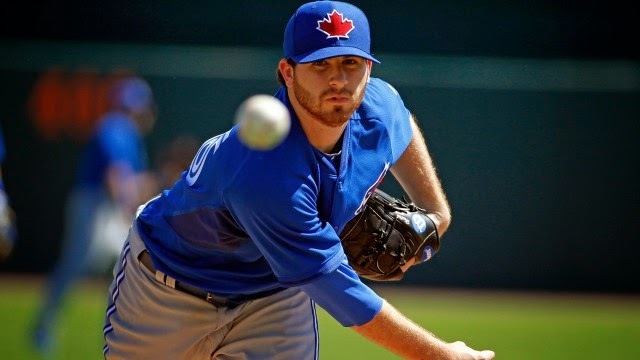 Drew Hutchison is making his case for the Blue Jays rotation.